Apple is planning to remove the 3.5mm headphone jack on the next-generation iPhone in favor of an all-in-one Lightning connector, according to often-reliable Japanese website Mac Otakara. Apple may also release Lightning-equipped EarPods to support the new audio output on future iOS devices. The report, citing a "reliable source," claims the new same-sized Lightning connector will support Lightning-equipped and Bluetooth headphones, and have a DAC, or digital-to-audio converter, for backwards compatibility with wired headphones using standard 3.5mm stereo jacks. A 3.5mm to Lightning adapter would be required. The so-called "iPhone 7" will likely be more than 1mm thinner than the 7.1mm thick iPhone 6s as a result, according to the report. The sixth-generation iPod touch could be a comparable device, with a depth of 6.1mm, but the portable media player still has a 3.5mm headphone jack. Apple will also reportedly release Lightning-equipped EarPods, which would likely be included in the box alongside the iPhone 7 and sold separately for use with other future iOS devices. Apple's current EarPods with a 3.5mm stereo jack will presumably remain available for purchase afterwards for the foreseeable future. 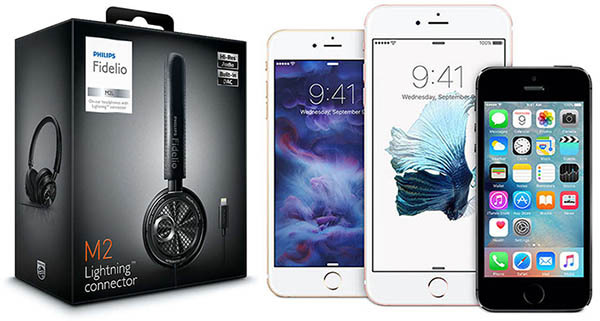 Apple introduced new MFi Program specifications in June 2014 that allow third-party manufacturers to create headphones that connect to iOS devices via a Lightning cable, but the rollout has been slow. Philips has unveiled Lightning-equipped Fidelio M2L and Fidelio NC1L headphones over the past 14 months. Should this rumor prove to be true, Apple's decision to switch to an all-in-one Lightning connector for charging and audio output could face the same kind of controversy as when the company retired its proprietary 30-pin dock connector in favor of a smaller Lightning connector starting with the iPhone 5 in 2012. Reminder that it's the 3.5 mm headphone jack that's the sole reason the iPhone is so thick. As if they need to be thinner. ... and render all other headphones useless (unless you buy a $200 adapter from Apple). Thanks, Taylor. do you wanna charge? or do you wanna listen to Apple Music? As stated, the iPod is thinner and has a headphone jack. I've feared this day might come. May have to jump ship. Adapter sold separately for just $19.99. Also, nobody needs to charge an iPhone and possibly use the audio jack as well! Bluetooth has the same audio quality as 3.5. I think we're getting to the point now where wireless headphones are good enough to replace wired ones for most people. They make it very hard to feel too excited about their products these days. I'll sack some hate, but whatever: the magic is gone. PS: Oh and how convenient to make the iPhone thinner again. That way you might lust for that separate port even more whilst listening to music when you face the obstacle of picking between charging and audio. Of course there will be Y-splitters, yours for just 29.99! Raise your hand if you are asking for even thinner phones with smaller battery. Seriously, what is with the obsession with thinness, even at the cost of removing the headphone jack?